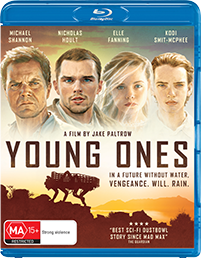 'Young Ones' is a stunning sci-fi tale of revenge and violence set in a post-apocalyptic, drought-ravaged future. After fighting off raiders to protect what little he has, Ernest Holm (Michael Shannon, ('99 Homes', 'Man of Steel', 'The Runaways') strikes a plan to bring water to his family’s barren farmland. When betrayal comes from those closest to him, it sets off a vicious cycle of greed, vengeance and murder. 'Young Ones' also stars Nicholas Hoult ('Mad Max: Fury Road', 'X-Men' franchise, 'Warm Bodies'), Elle Fanning ('Maleficent', 'Déjà Vu', 'We Bought A Zoo') and Kodi Smit-McPhee ('Let Me In', 'Dawn of the Planet of the Apes', 'The Road'). The 'Young Ones' competition has now closed. Winners will be announced shortly. Competition opens at 5pm AEDT on Sunday 6th December 2015 and closes at 11:59pm AEDT on Sunday 13th December 2015. Five winners will be chosen at random on Monday 14th December 2015. To successfully win, entrants must fulfil the above entry conditions before the time the competition closes. Current members/followers are eligible to enter the competition. Only one entry per person. Only one winner per household. To be a valid winner, the entrant must not have won a prize from SWITCH within the last 28 days. Each winner will receive one Blu-ray copy of 'Young Ones'. By entering, you agree to receive occasional emails from SWITCH in the future. If you decide to unsubscribe from these updates, any further entries will not be applicable. Only Australian residents are eligible to enter. 'Young Ones' is available on Blu-ray, Digital and DVD on Wednesday the 9th December 2015 from Icon.